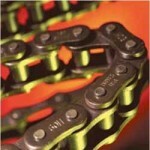 We are offering Transmission Chains to our esteemed customers. These chains are used in various applications and are highly appreciated for its smooth run, durability and long service life. They are easy to install and are manufactured using premium grade raw materials by the manufacturers.